An exciting news especially for designers in Brunei, the first ever logo design book for Brunei is now ready to receive submission. Brunei 100 Logo Design will feature Brunei’s top 100 logos as chosen by a panel of industry’s top talent locally and internationally. The relationship between Organisations, Companies, Design Agencies and Designers, and the contribution and role each plays in the development of society and nation can be seen from “Brunei 100 Logo Design; Best 100”. 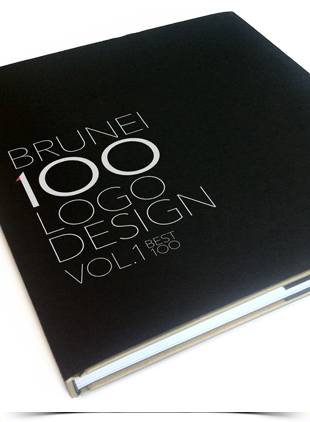 This will be the first logo design book for Brunei. It is a compilation of visual development from an identity design perspective and showcasing designers’ work of logos, brandings and corporate identities done for Brunei Darussalam. The panel of juries will be Jeff Fisher, an award winning designer based in Oregon, USA. Jeff Fisher is the Engineer of Creative Identity for Jeff Fisher LogoMotives and has authored many books such as "Identity Crisis! : 50 Redesigns That Transformed Stale Identities Into Successful Brands" and "The Savvy Designer's Guide to Success." Jeff Fisher has received more than 600 regional, national and international graphic design awards for his logo and corporate identity efforts. His work has been featured in HOW, Print, Graphic Design:USA and several international design publications. Over 170 books on the design of logos, the business of graphic design, and small business marketing have presented his efforts as industry examples. Dato Paduka Shofry Abdul Ghaffor is the owner of the Rainforest Art Gallery and currently hold the post of President of Brunei Art Forum. He was appointed Permanent Representative of Brunei Darussalam to the United Nations in 2002 and was the Permanent Secretary in the Ministry of Foreign Affairs before retiring in 2014. Haji Osman Mohammad is an Adjunct Senior Lecturer at FASS, Creative Arts & Communication, Universiti of Brunei Darussalam. He hold the position of Vice President of Brunei Art Forum and is the Managing Director & Creative Consultant at Creative Space Studio & Gallery. He carries with him 35 years experience in various media, creative art & design related. Haji Osman plays an important role in ministerial and national level as committee in advising Art & Design related issues. Haji Mohd Rozan bin Dato Paduka Haji Mohd Yunos is the Permanent Secretary (Media and Cabinet) at the Prime Minister’s Office since April 2014. Before that he was the Permanent Secretary (Culture and Community) at the Ministry of Culture, Youth and Sports, the Permanent Secretary (Administration and Finance) at the Ministry of Development, the Deputy Permanent Secretary at the Ministry of Finance and the Managing Director of Tabung Amanah Pekerja. He is active in writing and has published three books and have written more than 250 articles for the Brunei Times. He has also presented a number of papers in international and local seminars. He is active in the arts and cultures scene and has judged a number of photographic and arts competitions. Syen Sofian Abu Bakar is the Principal Designer at Syensai Design. Syen focuses in providing design and consultancy services in brand building and development, and has help to create and developed many brands and corporate identities both locally and internationally. With over 20 years of industry experience, he is an active member of the Brunei Creatives Industry and is the founder of Designers Alliance Brunei and also sit in the Brunei Art Forum Organising and Working Committee. Junli Lim is the Creative Director of Lava Media and with 15 years industry experience in Brand, Graphic, Print, Web and Art he is an active council member of Designers Alliance Brunei. Junli strongly believes in the importance and role of the Creative Industry in the increasingly competitive business market and is passionate in inspiring and equipping the next generation of Bruneian talents and helping creative businesses and start-up to grow and maintain their competitiveness. Noriati Puli is the Coordinator of The Brunei Times’ Visual Team and leads a team of visual designers in The Brunei Times that delivers creative designs and production that could communicate ideas that inspire, inform, or captivate readers, both online and in print. With over 17 years of work experience in commercial graphics design, Noriati started her professional career in the industry as a young designer; and is a firm believer in commitment, teamwork and passion. Brunei 100 Logo Design is supported by The Ministry of Youth, Culture and Sports Brunei Darussalam, The Brunei Times and is a joint effort of Designers Alliance Brunei and is organised by Syensai Design. The nomination, submission and selection of logos will be assisted by the selected members of Designers Alliance Brunei and will be finalise by the member of Juries. Designers Alliance Brunei [dAb] is Brunei's multi-disciplinary creative collaboration which started in 2008. dAb is a casual internet based informal grouping which was formed to provide a forum for the exchange of ideas and information relevant to the creative industry, locally and internationally. dAb also serves to encourage the sharing of opportunities, showcasing of talents and networking among creative individuals, organisations and businesses from the creative industries. dAb mainly focuses on Graphic Design, but other related design and creatives discipline such as fashion, architecture, music, visual performance, writing, illustration, art and any other creative discipline are also included in the grouping. + To facilitate the advancement of the design profession and to increase awareness and the value of the design profession and design industry in Brunei. + To promote and regulate standards of knowledge, skills and code of ethics for graphic designers in Brunei and establish what constitutes “fair play” within the creative industry. dAb is not about enforcing rules but creating awareness. + To provide a forum for the exchange of ideas and information relevant to design, creativity and related business opportunities. + To educate the public on the importance and benefits of graphic design in business and everyday life, and to enhance the profile of graphic design and other creative industries. + To encourage designers/individuals in the various field of creativity to form alliances for growth, learning and creative collaboration. There are no themes, this is not a logo design contest and it is not required for any entrant to design any new logo to participate. + Logo work can either be submitted by designer, agency or anyone related to the company or logo owner. Logo work can also be nominated by dAb members or members of the public to be proposed into the list of submissions. If requirement for publication release is not provided by the submitter or nominator, approval for the logo publication will be forwarded to the company owner of the logo. + Selection will be made by the appointed juries and members of Designers Alliance Brunei. 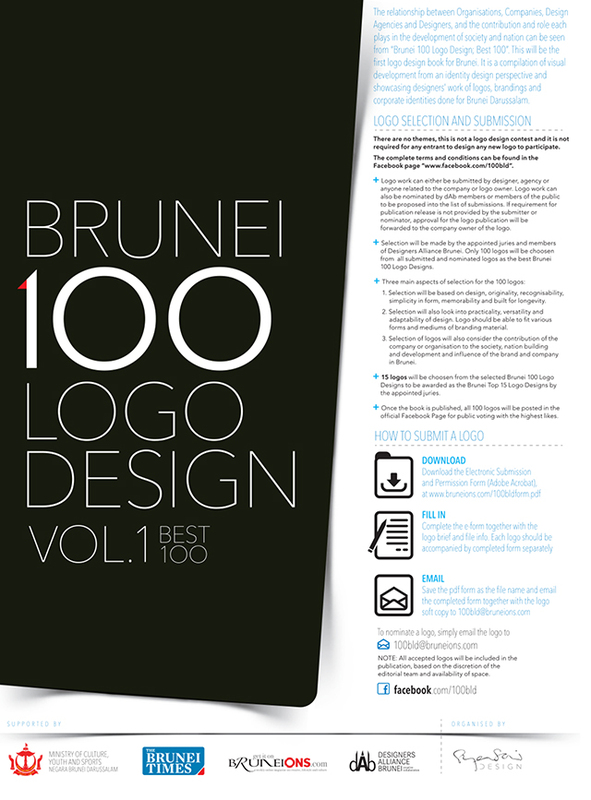 Only 100 logos will be chosen from all submitted and nominated logos as the best Brunei 100 Logo Designs. 1. Selection will be based on design, originality, recognisability, simplicity in form, memorability and built for longevity. 2. Selection will also look into practicality, versatility and adaptability of design. Logo should be able to fit various forms and mediums of branding material. 3. Selection of logos will also consider the contribution of the company or organisation to the society, nation building and development and influence of the brand and company in Brunei. + 15 logos will be chosen from the selected Brunei 100 Logo Designs to be awarded as the Brunei Top 15 Logo Designs by the appointed juries. + Once the book is published, all 100 logos will be posted in the official Facebook Page for public voting with the highest likes. + Commercially released by the closing date of submission (June 2015). + Logo was created for use in or for Brunei related work. + Produced in response to a genuine brief from a client or requirement. + Made available to the public through legal mediums. + Approved and/or paid for by the client. + Concept designs or works created only for the purpose of entering any competitions. + Identical work entered by another party. + Prototypes that have not been commercially released within the eligibility period. + If work was done pro bono for a charity or a non profit organisation. + The charity must have a valid agreement or understanding with the entrant agency. + The charity must have approved the work to run. + Self-promotion: self-promotional work is eligible only if it was released commercially and made available to potential customers. + In-house design and production: business owners can enter work that was produced in-house and made available commercially. + Work must be submitted as it was originally released. Only make alterations to the work if this is to meet the material requirements detailed in the Submission Specification. + In the event that a jury queries the eligibility of an entry, we will ask you to provide documentary evidence to demonstrate the work is eligible. + If the Organiser, dAb or the Author or the publisher establishes that an entrant has broken the submission rules, the offending entry will be immediately suspended from the Awards. The complete terms and conditions can be found in the Submission and Permission Form. Submit Your Best Logo Designs for Brunei 100 Best Logo, download here. For more information, please like the Brunei 100 Logo Design facebook page. To be in the World of Creative Arts or Not to be?